Building your brand and beautifully showcasing it across all your landing pages and campaigns is about to get a whole lot easier. Why? Because we tapped into our in-house marketing team and some Leadpages super users to share their favorite tips for quickly creating a consistent brand look and feel across multiple pages. Why bother with branding? Two quick reasons: the internet is chock-full of content and no one knows 1) what to pay attention or 2) who to trust. In addition to setting you apart from the masses, your brand is your promise: a promise to be consistent across every touch point, in an effort to establish credibility, and win trust. From your logo across hundreds of carefully-crafted paragraphs and headlines, your brand is your representative online and it both speaks and sells for you. In case you haven’t spent some time nailing down what your brand is and how it’s represented online, you may want to do that and come back to this post. But when you’re ready to start easily publishing landing pages, lead generation sites, and campaigns—this article is here to help you professionally and consistently display your brand across your customers’ entire journey. In this article, we’ll showcase some outstanding branding examples and give you some easy, actionable tips you can take away and immediately apply to your next Leadpages project. One of the best ways to shave downtime and frustration is to keep your brand elements on hand when you sit down to design and craft your landing page. This way you won’t have to pause your project in search of the elements you need in order to publish your page. 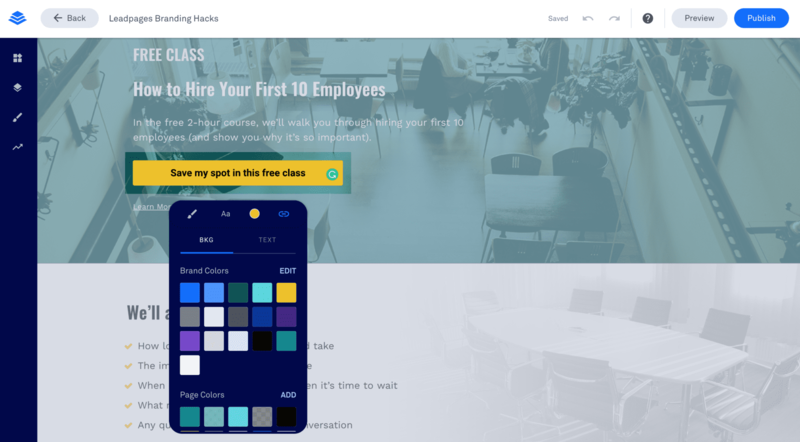 Inside Leadpages, you can easily set your brand color palette and draw from this core collection of colors everytime you want to customize a page element—from a headline to a hero background section. After you select your brand colors and fill up your palette, this collection will be available within the color selector every time you want to customize an element on a landing page or Leadbox. Ideally, you’ve crafted a brand color palette that includes 3-5 primary use colors and 3-5 secondary use colors (to give you a little flexibility to break the mold every now and again. 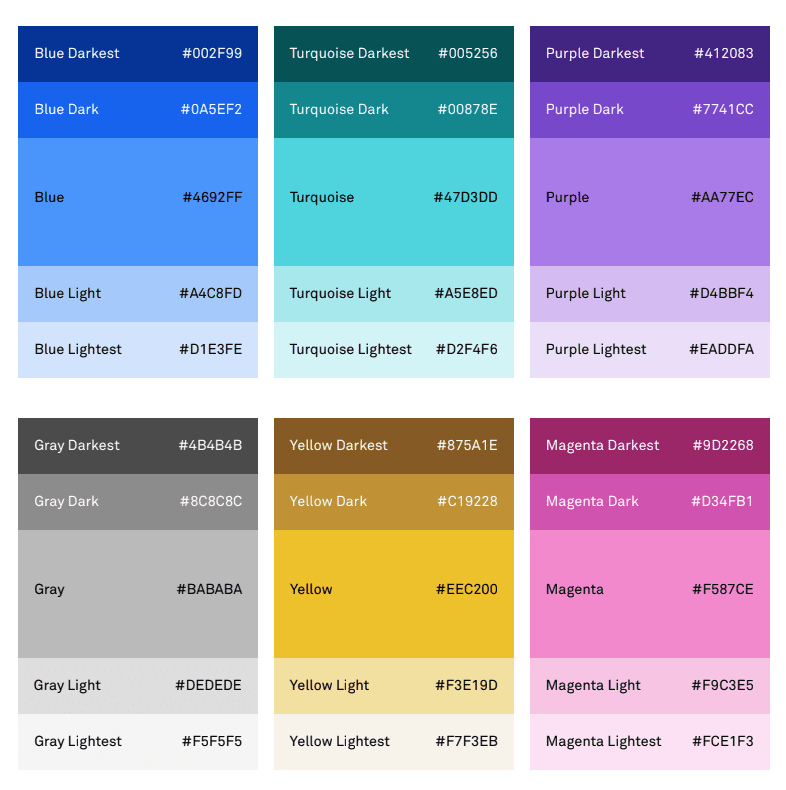 Here’s a sample snapshot of the brand color palette used by the Leadpages marketing team. Create a bit of brand consistency by sticking to 1-3 fonts for your brand and try to limit yourself to 1-2 fonts per landing page. You probably have your logo always at the ready, but you may not have all the variations you need so that you can display your logo across different page stylings. Using global page stylings allows you to really quickly set and change fonts on the entire page and apply these stylings to text boxes and new widgets. It’s a good way to keep everything on your page consistent and to speed up the time it takes to create a single, professional-looking page. For example, you can change all the Header fonts or paragraph level fonts with a single click. You’ll be able to set your desired font and color for all of our headline tags and text hierarchies, including Jumbo, Headline, Subhead, and Small subhead. In addition to the page styles tab inside the Leadpages builder, you can also set in-line font styles by clicking directly on the text box within your page. Keep in mind that whenever you set an in-line font, you’ll effectively override the page style that you select. Pro tip: Nail down your fonts using the page styles tab and apply your brand colors to your headlines before you begin changing the styles on individual text boxes and widgets directly on the page. This way, all the new text that you add onto a page will conform to your global page styles. While Leadpages is automatically mobile responsive and will adjust your pages to optimally display across any device size, there are a few handy tricks you can do—as a page designer—to make sure the best possible version of your page appears on smaller screens. Simply duplicate your desktop header and adjust the copied version to create a mobile-specific header that displays a smaller variation of your brand’s logo. All you need to do is duplicate your desktop header or create a new header right above it and because everything is centered on a mobile view, choose a logo that displays well as a centered thumbnail (often just a mark, not a logotype). Stock photography can be great (though not always ideal), but what do you do when you find a fabulous photo that isn’t exactly on-brand or synced up with the style of your page? Thankfully, there’s an easy branding hack inside Leadpages that lets you quickly adapt it and make it your own. If you want to use a photograph that doesn’t feel particularly on-brand, one simple hack is to add a semi-transparent overlay. Pro tip: When selecting your overlay color, try using a gray overlay or choose a color from your brand palette. Think of the information structure of your page as a process of both educating and persuading your audience—from the headline to the subheader, bullet points, paragraphs of text, and social proof. Not every web visitor will require the same amount of convincing before their ready to take action: some people will click as soon as they land on the page, while others will scroll down to the bottom. By keeping the call-to-action button present at multiple points on the page, you can easily capture the web visitors who need a little more convincing, without forcing them to scroll back up to the top. Pro tip: While you might mix up the copy on the button the call to action should remain the same. Keep in mind that if you’re getting crafty with your language, clarity should trump creativity every time. Why? Because confusion never converts. But don’t run off and publish a kind-size footer that’s filled to the brim with social media icons, share links, and the lyrics to your favorite song. Doing so would only serve to distract and detract from your primary call to action and nobody wants to lose a new lead who wanted to check out your Twitter profile instead of downloading your ebook. That would be sad indeed. The idea here is to keep is short, sweet, simple, and standardized across all the pages you publish. Pro Tip: Still want to include all those fabulous social media buttons and links back to your blog or website? Stick them on your thank you page instead of within your landing page footer. You’ll still be able to promote your content without clouding your message at a critical juncture. 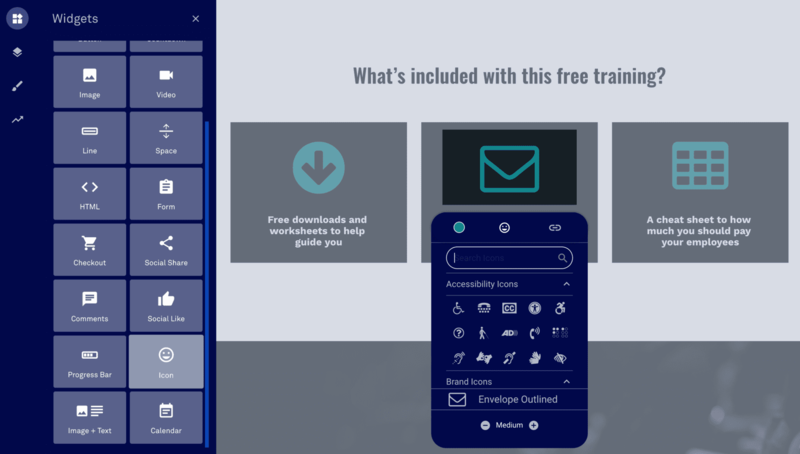 Inside the Leadpages builder, the icon widget allows you to sort through a huge icon of hundreds of different icons that are ready to be put into use on your page. Scroll through, find an icon that speaks to your needs, and easily edit the colors to match your brand. The colors and sizes of icons within the icon widget library can easily be adjusted to align with your brand and visual communication style, but in the case that you can’t find what you’re looking for, you can also easily upload your own iconography using the image widget. Pro Tip: If you decide to upload your own iconography, just keep in mind that if you want a transparent background, save your image file as a .png (this will remove the white background of your image). If you’re looking for an easy way to create page sections that can be easily reused across different campaigns, one of the best ways to accomplish this is to create a master page template that you simply copy and customize for multiple campaigns. Think of this as stocking your creative toolbox so that you don’t have to rebuild from scratch every time you want to publish a new page. By pre-designing section templates in this way, you can create and duplicate headers, footers, testimonials, product sections, or benefits sections and more. Not only will you shave time off of every page build, but you can ensure your landing page is always on-brand and looking good. Then quickly customize the sections you want to use and delete (or hide) those that you don’t! Pro Tip: Use the show/hide function to easily remove sections from the page without deleting them entirely. Then, if you want to tweak the page, unhide the sections and you’re off to the races! If you’re publishing a mini-site, about me page, or hosting an event, you may want to include a headshot on your page to add a touch of authenticity to an otherwise anonymous webpage. Include your headshot next to your bio section and let your audience get a sense for the person behind the curtain. Hopefully, you have a gorgeous headshot on hand and while there’s no perfect replacement for a professional photographer, there are some hacks that can help you create a decent homemade version. Natural light is a photographer’s best friend because it tends to flatter every skin tone, elevates the quality of the image, and is cheaper and less intimidating than a professional light setup. Portrait mode is designed to designate an object on which to and slightly blur all other elements, in order to mimic the effect of a DSLR camera. Most importantly, it makes a big difference. Wondering which smartphone has the best portrait mode to tackle the job? Business Insider tested portrait mode on three of the top smartphones in the world, and there’s a clear winner. Forgo a tripod setup and recruit a friend or family member to take the picture for you. You’ll wind up with a better result and benefit from their live feedback on what looks good. Your customers/ clients want to work with someone that has good chemistry and charisma. Let your personality poke through and allow yourself to crack a smile. If you were to spontaneously switch between an Irish and New York accent in the middle of a conversation, you might raise a few eyebrows along the way. Well, you can cause the same kind of confusion and discomfort when your writing style flip flops from one landing page or campaign to the next. Style: the effect you create through your language and writing mechanics and what your writing looks like, for example when you use capitals, how you spell certain words, etc. Voice: that something that makes your writing sound uniquely like you. Tone: the overall attitude you create through word order (syntax), point of view, word choice (diction), and level of formality. Tone could be candid, pragmatic, witty, unassuming, etc. By spending some time to identify what style, voice, and tone you consider to be on-brand and what you consider to be off-brand, you’ll be able to create a consistent experience for your audience. Why is that so so so important? Because your brand is your promise. It’s a promise to not only solve a problem (through your product/ services), it’s a promise to be consistent and clear in an attempt to win people’s confidence and trust. 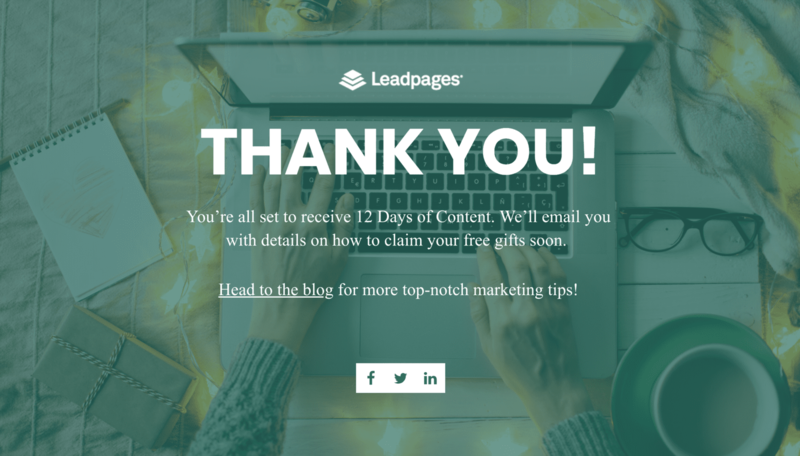 What are your favorite brand hacks and design tips inside Leadpages? Tell us in the comments section below, we’d love to hear from you!